As a result of months of effort by Ken Nichols and Rodney Vorndam, the use of Kendall County towers by KARS repeaters is now formally approved by the County Commissioners Court and the County Judge. Here is our current status. 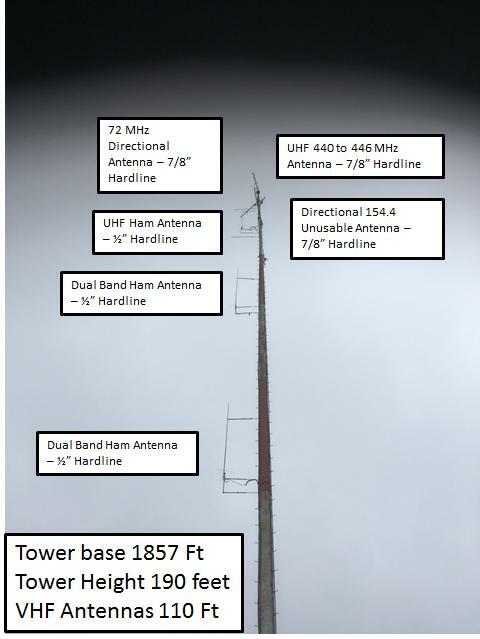 · VHF: 146.64(-) pl tone of 88.5 located at around 1700 feet on our tower at Tower Road. · VHF: 145.19(-) pl tone of 88.5 located adjacent to the Kendall Co. Sheriff's Department. u UHF: 444.9 (+) PL 88.5 using the upper UHF antenna on our tower at Tower Road. Background: The County told us some time ago they wished to consolidate communications at the EMS site on Jennifer Road. In exchange, the County offered the old Kendall County Sheriff Office (KCSO) site on Tower Road to KARS to use, backup generator, tower and all. We surveyed the building and, with the Board approving cost, Marsh Pronneke accomplished extensive repairs amounting to almost a complete rebuild, mainly to remove dry-rot, insulate, and water proof the building. Repairs are complete, and the .64 machine is now located in its new permanent home on Tower Road. The picture below shows what we have to work with. We have two working 2-meter antennas and a possible 150 MHz antenna system. Our plan is to take our 2-meter antenna and coax off the Jennifer Road tower and reinstall this at Tower Road. Then we will have three workable 2-meter antennas at varying heights. Functionality of the 450 MHZ antennas needs to be confirmed. Primary power will be from the AC Mains with battery backup. We inherited the backup generator on site and will refurbish this later on. The DR-2X fusion repeater (.64) will be the primary repeater on this tower. So, what is the overall plan? Here is the Road Map the Membership has approved. Establish a 2-meter FM repeater with wide area coverage "head and shoulders" above existing machines in the area. Support both "pure" FM and emerging digital standards. Build a microwave link to provide a internet connection at the repeater. Provide ability to "call in" via internet to participate in NETS from a remote location. Link (if desired) with other repeaters to expand range. Our goal is to make this the premier repeater in the Hill Country. We will support both "pure" FM and emerging digital standards. We plan to provide APRS capability and a mesh network at 2.4 or 5.8 GHz to a remote site with an internet connection. With this we will have the ability to "call in" via the internet to participate in NETS from a remote location. 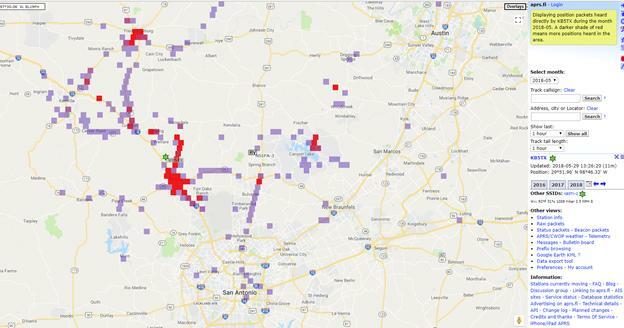 Microwave Link- we have ordered the 5.8 GHz links and will be testing sites during July - August prior to selecting a semi- permanent location to “tie into the internet.” A final step will be to link with other repeaters in the area to expand our range. Steve Lazar has the KB5TX APRS Digipeater on the air from the tower road site effective 21 May. Currently we are running an ICOM IC-2100 with an output power of 25 watts and the TinyTrak 4. Our antenna is about halfway up the tower for an estimated height slightly over 1700 feet using the lower of the two existing 2-meter antennas. Look at www.aprs.fi and search for KB5TX. Here it is. 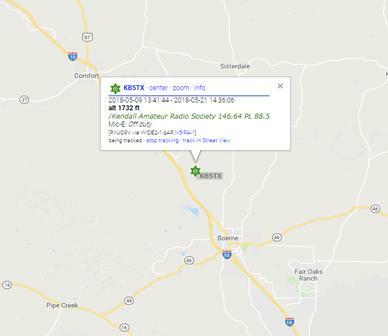 The various station locations which were heard directly on the KB5TX Digipeater are shown below on a screen shot from www.aprs.fi. Over time this will allow us to estimate what our system coverage. But from what is shown below, one would have to agree that it is pretty good. Our APRS machine is on the air at Tower Road. Additional enhancements (win-link etc.) are planned. Greg -AB5I provided the TT4 and we are using an IC-2100 radio mated to this. The coverage is quite good as we have seen packets from mobiles in Austin. Internet- The internet connection was recently installed at the tower road site thanks to Mark -N5YZV and Bee Creek Communications. This will provide the wires-X connection as part of priority #1 with anticipated Wires-X operation in 1Qtr 2019. Mark was able to get a “free” connection with the caveat of placing the provider name on our web page. You may have noticed a change in the coverage at 146.64 Mhz. We have been experimenting with the VHF antennas on the tower, with our signal coverage on 146.64 Mhz varying as we tried one and another. We are back to the antenna at 110 feet up the tower and at around 1970 feet above MSL. The club now has 2 DR-2X fusion machine – one operating on 146.64 at Tower Road and the other on 145.19 at the Sheriff's Office to give us enhanced coverage of the Downtown Boerne area. The CW ID on our repeaters is set to 20 WPM- which is the maximum speed allowed under FCC rules. This is mentioned as we have been asked if we can increase the speed beyond what it is currently at. The answer is "No."